If your are an MLBA Member you may already have an account. Email mike@mlba.com for your username and password. If you do not have an account, we can set one up for you. If you are not an MLBA member you can sign up for membership here: Member Application. If you would like to set up a classroom training course held at your place of business, please email robert@mlba.com or call MLBA at 651-772-0910. Here you will be able to purchase training credits for your staff (see “Available Credits” above). 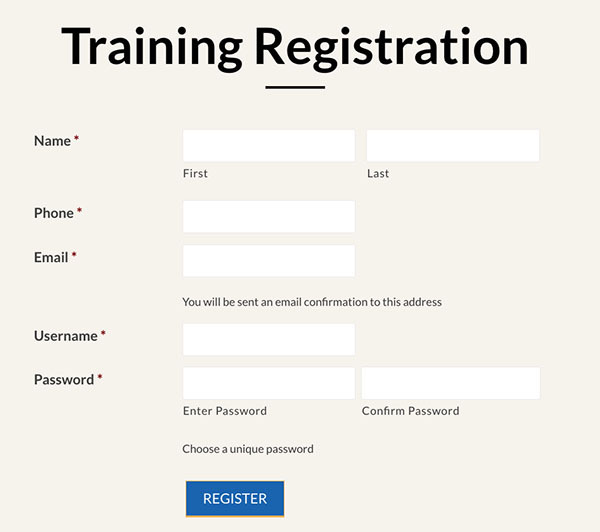 You can have your employees purchase their own training credit when they register for a course, but you will not be able to track them on your home “Dashboard” page. Once an employee registers for a course you will be able to track their progress through the 12 part course (pre-test, 10 video segments, and post-test), see above under “Employees”. You will also be able to post comments in our interactive user forums (when available) and even pay your dues online. 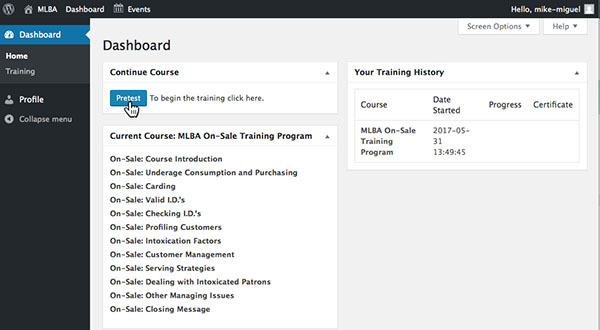 Note: if your employee has taken the MLBA SALES Online course before, they can avoid registering and login with the username and password they registered with before. If they forgot their password there is a link for them to retrieve that. 1. 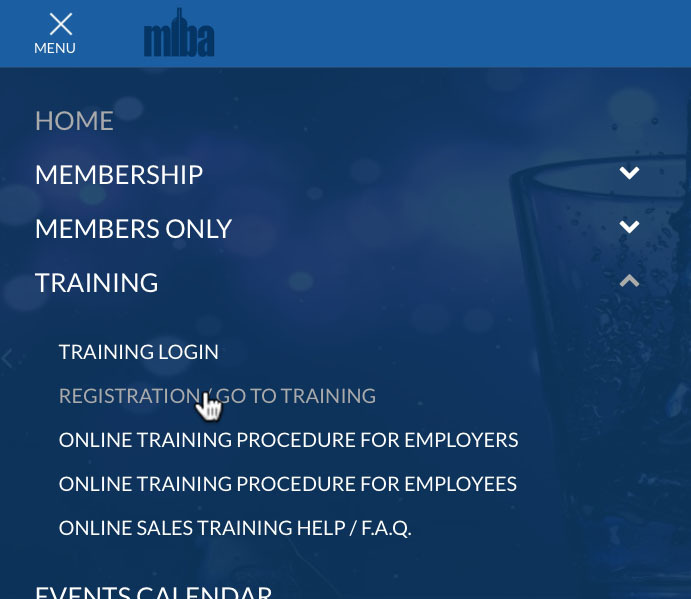 Have your employee go to MLBA.com and click on the “Menu” in the upper left corner and then click on the arrow next to “Training” and choose “Registration/Go To Training ”. 2. They will then fill out the form with their name, phone and email, as well as a “unique” username and password. They can use their email as their username if they so choose. Once the form is filled out, they click “Register” at the bottom. 3. It will then ask what type of training course they would like to take, “on-sale” for bartenders and waitstaff or “off-sale” for liquor store employees. Make sure they choose the correct course, they cannot go back and change it. 4. Next it will ask for the a training credit code. This can be provided by the employer (from their Available Credits) or the employee can purchase one here for $30. However, if the employee buys their own credit, they will not show up on the employer’s “Dashboard” list of employees but the employee can still print out the Certificate of Completion for your records. 1. Once the student has registered, chosen the type of training course (On- or Off-sale) and entered a training credit code, the training starts on the student’s “Dashboard” table of contents page. To begin the training, click on the blue “Pre-Test” button. 2. The Pre-Test is around 30 questions and each question must be answered before they can move on to the first of 10 video segments. It does not matter if the student does not know the answers to the pre-test, they will have a chance to answer the test questions again after each video segment, and again at the end. 4. Final Test: After the last of the video segments, the student will take the final test. Each question must be answered correctly to pass the test. If any questions are answered incorrectly, the student will be able to go back and correct their mistakes. 5. Once all questions are answered correctly, the training returns to the “Dashboard” table of contents page. The student may print out a “Certificate of Completion” by clicking the “Certificate” link under “Your Training History”. Want to learn more? Click here for Frequently Asked Questions.